Micnaron 2018 NEW Design Solar Power Pump, Bird bath Fountain Pump Brushless Pump for Garden and Patio Watering (Black) by Micnaron at Go Plots. Hurry! Limited time offer. Offer valid only while supplies last. View More In Pumps & Circulation. The pump will start automatically in 3 seconds when sufficient sunlight gained, no battery or wire needed,and can be easily move to different locations. With different sprayer head ,different head will have different performance. Suitable for various occasions, like bird bath, fish tank, small pond, garden decoration, water circulation for oxygen. 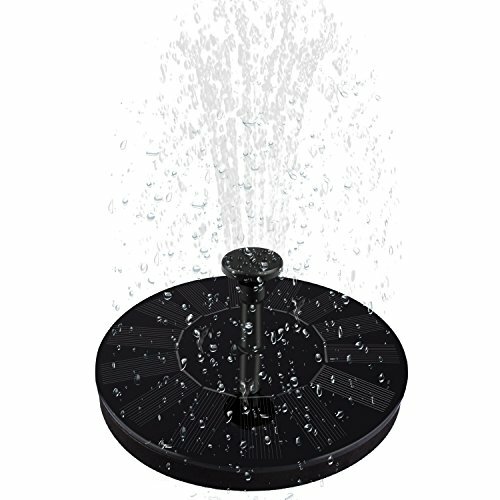 Tips:Put the solar fountain on the water with its nozzle over water, make sure the solar panel face directly to the sun, no shadow. Notice:Working power of the solar panel will be influenced by weather, location, etc. If you have any questions about this product by Micnaron, contact us by completing and submitting the form below. If you are looking for a specif part number, please include it with your message.